If the area of your BASEMENT is 700-1,200 sq. ft. you would need a budget of about $4,700 – $12,650. The package would include installation of 1/2” ceiling board, installation of 1/2” regular drywall on walls and bulkheads, installation of 1/2” water resistant drywall in the bathroom, installation of 1/2” densshield in bathroom tiled areas, installation of metal corner bids, taping and sending of new drywall, smooth ceiling, ready for primer. Labour materials and delivery included. If the area of your HOUSE is 1,200-3,500 sq.ft. you would need a budget of about $6,800 – $36,200 The package would include installation of 1/2” ceiling board, installation of 1/2” regular drywall on walls and bulkheads, installation of 1/2” water resistant drywall in the bathrooms, installation of 1/2” densshield in bathrooms tiled areas, installation of metal corner bids, taping and sending of new drywall, smooth ceiling, ready for primer. Labour materials and delivery included. 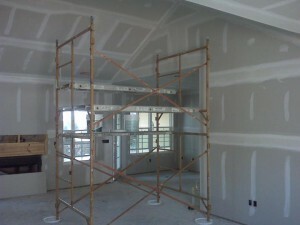 How we price the drywall installation? There are several methods we use when we have to price the drywall job. Preliminary quote on drywall boarding can be issued over a telephone based on the square footage of the area that needs drywall installation. 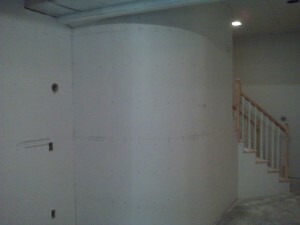 As drywall contractors we need to know the total area of drywall board for the rough quote. We usually ask over the phone total floor area and clarify if the area is an open concept or divided on section/rooms. Than we ask about ceiling height. The formula for open concept area on drywall installation total square footage is floor area square footage multiplied by 3.5 , for the area with rooms: floor area sq footage multiplied by 4. For example, if we required to install drywall in the house that has 5000 sq foot of the floor area with 8’ ceiling height and open concept, than amount of the drywall board that we will have to install will be roughly 5000×3.5=17500 sq ft.
Than we multiply the total square footage of the drywall board by the price per square foot. Of course it works the best if the drywalled area doesn’t have custom features like multiple custom shaped skylights, cathedral ceilings in rooms and unusually shaped entrances, amount of corner beads also play role in the drywall installation pricing. 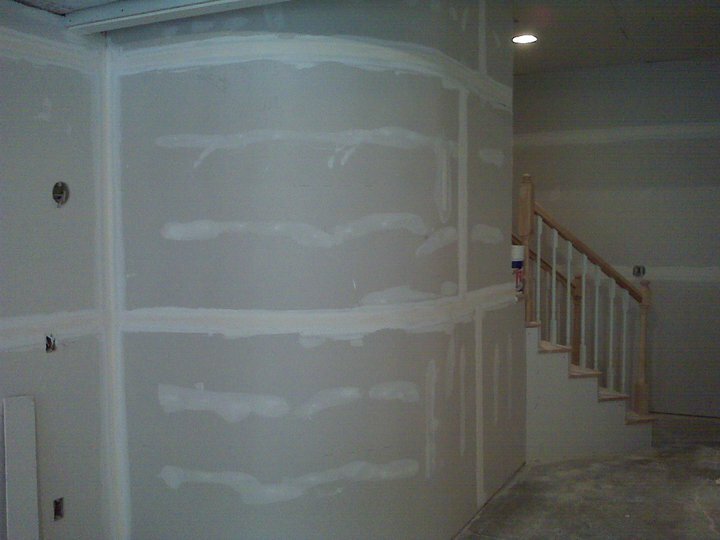 In the case of custom situation it will be the best to arrange for a visit of our certified professional drywall estimator to get more accurate quote. To find out more you can always contact or call us at 647 866 0201 and we will be happy to help you with your drywall installation price . Today I want to talk about our Drywall Taping Prices and teach you how to calculate the exact cost for your home project. If you apply this simple formula, you will quickly and accurately calculate the right price for your drywall taping project.